Eratosthenes was born about 284 B.C.E. in Cyrene (now Shahhat in Libya) and studied in Athens at Plato’s Academy. Ptolemy invited him to Alexandria (present­day Egypt) where he worked as the director of the famous library there. While in Alexandria, Eratosthenes had a specific interest in collecting and furthering geographical knowledge. His book Geography (c. 240 B.C.E.) was the first treatise to give a mathematical basis for measuring Earth as a sphere measured along latitudinal lines and meridians. Eratosthenes used the fact that, on the first day of summer, the sun was directly over the city of Syene (now Aswan in Egypt) but that it made a small angle with a vertical pole at Alexandria. Then, using an estimate of the distance between the two cities and a theorem from EUCLID’s Elements, Eratosthenes calculated the circumference of Earth as being, in modern terms, about 24,662 miles. Our modern estimate is 24,860 miles: Eratosthenes’ calculation is remarkably close. Eratosthenes invented a method for doubling the cube as well as a way of finding prime numbers, now known as the Sieve of Eratosthenes. A prime number is divisible only by one and itself. His construction eliminates all whole numbers that are products of other whole numbers, so only the prime numbers fall through the “sieve.” He does this incrementally by keeping the number one, and then eliminating every second number (multiples of two), then every third number (the multiples of three, which is the next remaining number), then every fifth number (the next remaining number), and so on. While the method is slow and repetitious, it is foolproof in its accuracy. It is thought that, in about 192 B.C.E., unable to continue as a scholar because of failing eyesight, Eratosthenes starved himself to death. As the first mathematician and geographer to reasonably calculate the circumference of Earth, Eratosthenes is considered to be the father of geodesy, the study of Earth’s size and shape. His mathematical insights and constructions remain with us today, and his position as librarian at Alexandria influenced scholars of his and succeeding generations. Eratosthenes’ vast knowledge, acquired not just through study but through his years of directing the library at Alexandria, earned him the label of “the second Plato” from his colleagues. The extent of his influence over his contemporaries, as director of the library, cannot be overestimated; he functioned as one of the organizers and gatekeepers of the knowledge accumulated from the vast holdings of Greek civilization, then centered in Alexandria. 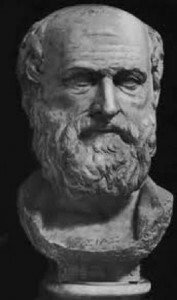 Pappus of Alexandria, one of the last great mathematicians of antiquity; preserved Eratosthenes’ work, as well as that of other mathematicians, in his Synagoge, finished in 340 C.E. Pappus’ efforts did much to keep mathematics alive; however, in the late Roman Empire (235 to 641 C.E. ), the contributions of Eratosthenes and other Greek mathematicians fell by the wayside. Eratosthenes’ famous calculation of Earth’s circumference is considered to be the first step in the early field of geodesy. Several centuries before, the Greek mathematician PYTHAGORAS (c. 580­500 B.C.E.) concluded that Earth is spherical, and Aristotle and other Greek scholars concluded the same. Eratosthenes’ efforts, however, marked the first effort to apply a mathematical technique to calculating Earth’s circumference. Eratosthenes’ calculation remained the most accurate measurement until late in the seventeenth century. At the end of the 1500s, the Danish astronomer TYCHO BRAHE introduced the concept of triangulation, which uses a chain of triangles rather than Eratosthenes’ single triangle, to measure an arc. Soon after, Dutch mathematician Willebrord van Roijen Snell used triangulation in calculating the circumference of Earth, and, by 1684, when Jean Picard used a telescope to help measure successive triangles, a more accurate measurement supplanted Eratosthenes’ calculation. Eratosthenes’ method of determining prime numbers survives today. At an early stage in students’ mathematical careers, they are inevitably exposed to the Sieve of Eratosthenes. Not only does it enable students to arrive at a list of prime numbers, it also—and more importantly—helps explain the concept of prime numbers in a practical and unambiguous way. Eratosthenes – c. 284-­192 B.C.E. *Scholars find it difficult to date the specific events in Eratosthenes’ life with accuracy.